Relationships are hard work. Relationships in the modern mobile age are about ten times harder. It comes down to more than just a message and smart branding – it's one part heart, one part messaging and about four parts data science. What worked yesterday probably won't work today and it definitely isn't going to be good enough tomorrow. Publishing superpowers CBSi and Thrillist are two best in class examples of mobile success stories. CBSi of course comes from the same organization that gave our great grandparents the news – this monolithic media company has now transitioned gracefully into the digital age. VentureBeat lifestyle peer Thrillist, meanwhile, is dominating the new media publishing space. What do they have in common? Each of these titans adopted to changing usage models through predictive tech and machine learning to build robust user data banks. We’ll learn how they’re delivering relevant user experience at scale. 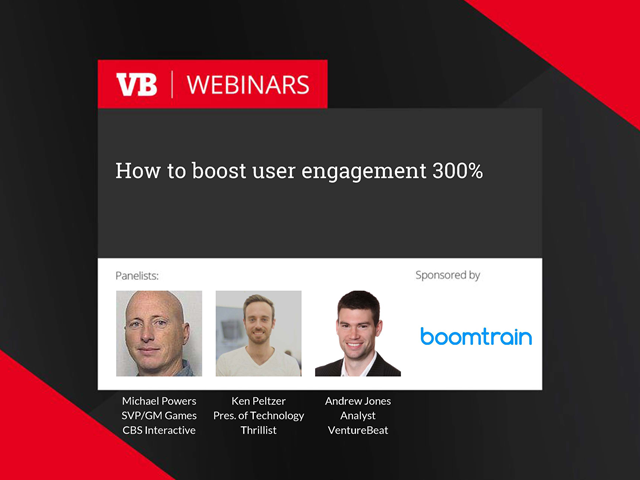 We’ll find out how they went mobile to triple their user engagement and find out how machine learning can be applied in actionable ways to increase personalization and deliver bottom line results – today. * Learn how to use machine learning against user profile data to increase user engagement. * Boost user engagement and retention by 300% through predictive technology applied against email, website and mobile deliverables. * Get the scoop on how digital marketing is changing – and is no longer the same space as it was last year. Register today for this free interactive web event and get the opportunity to have your burning questions answered by Powers and Peltzer LIVE in the panel discussion.